Butterfly legends and lore and the symbolism of butterflies from around the globe. There are many links with butterflies in mythology from all around the world. The metamorphosis of butterflies and moths is one of the mysteries of Nature. The ability of these insects to change from the crawling caterpillar to the flying adult is almost magical. The butterfly has become a symbol with many meanings, but most commonly symbolizing rebirth, renewal, transformation and hope.. 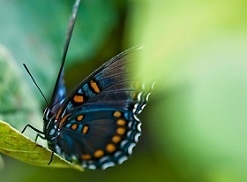 Many ancient civilizations believed that butterflies were symbols of the human soul. In some cultures it was cultures believed that a new human soul was born each time an adult butterfly emerged from its cocoon; in other cultures, butterflies were also considered to be the souls of those who had passed away. Because of this belief that the human soul took the form of a butterfly, they were often viewed with great respect and sometimes with fear. The butterfly also symbolizes the springtime and summer season, feminity, sensuality, and anything that is beautiful, graceful and positive in nature. Throughout history, butterfly imagery has been used more frequently in “decorative objects” than most other living creature. In Chinese and Japanese cultures butterflies represent the essence of joy and happiness. In both cultures, butterflies were added to manuscripts, paintings and drawings. Northern Europeans throught that dreams were the result of the soul-butterfly's wanderings through other worlds. Born out of the caterpillar in the chrysalis, butterflies were a symbol of rebirth, regeneration, happiness, and joy to Native Americans in Mexico; Some tribes considered a symbol of fertility of the earth. The Meso-Americans have deeply incorporated the butterfly in their myths. In Aztec and Mayan mythology, the god of fire Xiutecutli is represented as a butterfly. Fire, like the butterfly, is a symbol of transformation. The Goddess Iztpapalotl, the Obsidian Butterfly, stands for purification and rejuvenation by sacrifice. The powerful plumed serpent god Quetzalcoatl is described as initially descending to earth in the form of a chrysalis, then painfully emerging into full light as a beautiful butterfly and a symbol of perfection. In Mexico, the butterfly is a symbol of the spirit. In the small village of Anguangeo, a steady stream of Monarchs show up at the time of Dia de los Muertos (Day of the Dead) and is believed that the butterflies are spirits of their ancestors come back to visit. Festivals and parades are performed to honor this wonderful event. After over 25 years of field photography and scouring through museum insect collections, Kjell Sandved succeeded in finding all characters of our current alphabet within the astoundingly beautiful and varied wing pattern designs of butterflies and moths. Ancient Mexicans dedicated an entire palace to the butterfly at Teotihuacan, just outside Mexico City, naming it Mariposa.